There's no such thing as too much lounger time. Enjoy the stunning vistas from the rooftop, sips in hand. It's almost too pretty to mess up, but there for you nonetheless. Seriously. It's just. That. Spectacular. Or stop by later for fancy happy hour small plates - it's all fair game at the inviting adjacent Orange Blossom restaurant. The Boulan's lovely rooftop pool is perfect for lounging in the sunshine, as well as for taking in the Instagram-worthy views. At Boulan, no need to leave behind furry friends under 30 pounds. Fee includes a dogbed and food and water bowl, so your pets feel pampered too. Take a break from the beach with a day at the Miami Beach Golf Club. Perfect your swing on the driving range or make your way through a full 18 holes. Enjoy stylish modern suites and the well-done Orange Blossom restaurant around the corner, offering complimentary breakfast for Boulan guests. Be sure to ask about a suite with a private balcony. A cold drink in the fresh air is the perfect end to a sunny Miami day. You're just a 20 minute drive to the American Airlines Arena, home of the Miami Heat. To feel the Heat, look up the next home game! Take the crew for a 20 minute drive across the Rickenbacker Causeway to find a sprawling sea park. See dolphin shows, seal feedings, sharks, penguins and more. If there's a shopaholic in your crew, then Collins Avenue is the place to go. This popular strip features fab restaurants and extensive shopping. If you're looking to grab a bite or shop, head for Lincoln Road – the whole strip is a pedestrian mall. For a look into the local history and culture, stop by the Historic District to explore the world's largest collection of Art Deco architecture. Just a 12 minute drive away. Chic, classic South Beach, the Boulan is a stylish Art Deco design boutique, exuding Miami-ness from the rustling palms to the rooftop pool. It’s pet-friendly for pooches up to 25 pounds, providing dog mats, water and food bowls in your suite. Just a block off the 21st Street beach, you’re steps from the surf and sand. Claim your two complimentary lounge chairs, aim them sun-ward and adjust them to just the right angle for magazine flipping and people watching. When you’re ready for a break from the crowds, escape to the serene zen garden, a lush oasis of tranquility with its bubbling fountains and furnished conversation areas. The rooftop pool is equally spectacular day or night, with breathtaking views over the beach. Hit the small fitness center so you feel slightly less guilty indulging in the vibrant SoBe dining/nightlife scene. If it ends up being a late night and you snooze a few hours longer in the morning, no worries. The cheery, welcoming Orange Blossom restaurant adjacent to the Boulan serves breakfast all day (complete with a cold-pressed juice aptly dubbed After Party). The spacious Ocean Suites are all sleek lines and clean whites – if the Stephen G. interior design team was going for laid-back, beachy sophistication, they nailed it. Choose from a variety of (all gorgeous) options: the terrace, deluxe or standard one-bedroom, or the ocean view, luxury rooftop or two-bedroom, and premier penthouse suite. The suites range in size from 950 to 2,100 square feet, and all feature luxe touches like pillowtop mattresses and stunning marble baths with rain showers. Each has a gourmet kitchen for fancy DIY happy hours, and modern limestone floors throughout. Should you decide to spring for the two-bedroom, 2.5 bath penthouse (do it! ), you’ll have a staircase with private access to the rooftop pool and garden, plus a wraparound terrace with access from both bedrooms. It won’t take long to get the lay of the land, but here are the essentials. Lincoln Road is the lively pedestrian mall in the heart of Miami Beach, loaded with restaurants, bars and clubs, movie theaters, performing arts venues, and coffee and gelato shops. Ocean Drive, lined with classic Art Deco architecture and boutiques, just happens to be one of the world’s most famous streets – while Wynwood and the Design District host Art Deco weekends, art walks and the Miami offshoot of the world-famous Art Basel. If you’re up for venturing beyond the beach, Coral Gables and Coconut Grove are worth the short drive. 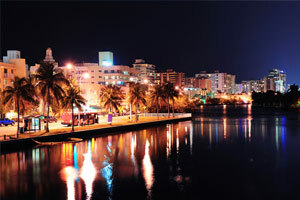 Or hit Calle Ocho for a taste of Cuban culture and cuisine. No matter where you’re headed, the 24/7 concierge team can point you in the right direction.